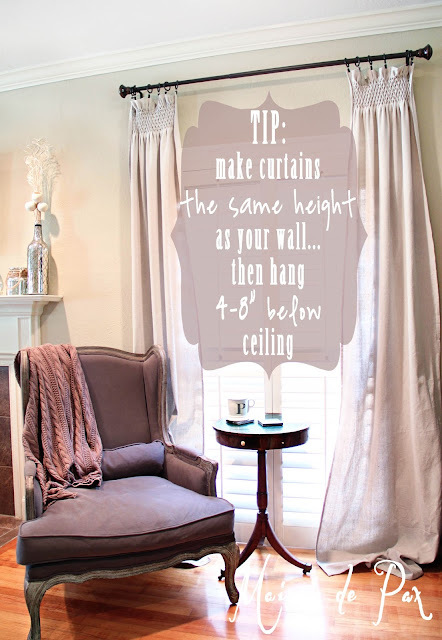 I know drop cloth curtains have been all the rage for some time in the DIY world, but I had my first experience with them last summer when I decided I needed to dress my three tall living room windows. Six 9′ panels don’t come cheap, though, so I began looking for affordable yet unique options. The result? 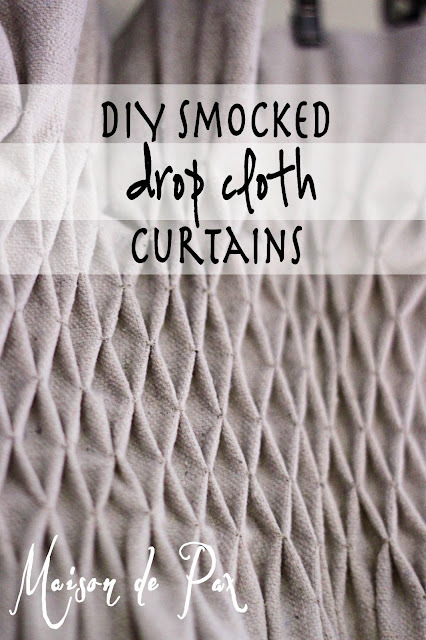 Smocked drop cloth curtains. 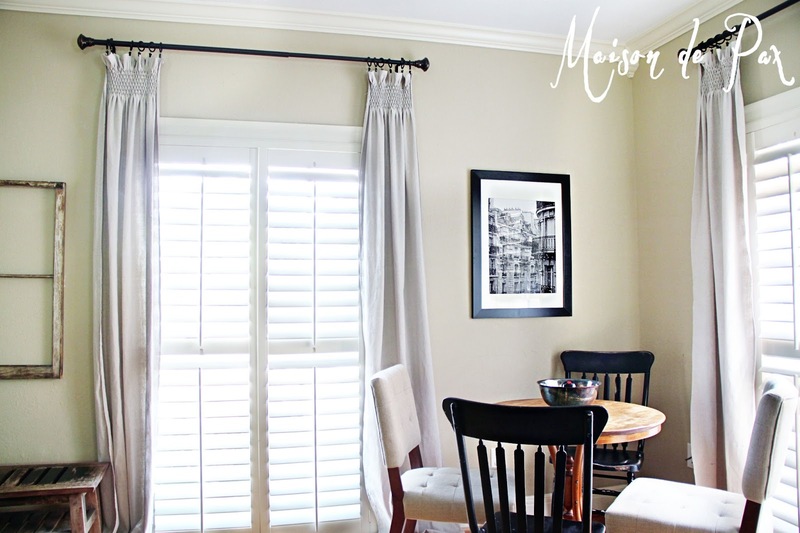 These curtains actually emboldened me to try my DIY ruffled curtains. I must say that both turned out better than I could have imagined; they were time-consuming, but totally worth it. Now I only wish I’d discovered my $5 “reclaimed” wood curtain rods before I hung these! The smocking makes them so…. scrumptious. No. other. word. for. it. I made these over the course of a month or so right after my son was born, so no process pictures… sorry! Before I give instructions, though, I will tell you a little secret. Are you ready for it…..?? Ok, enough confessions suggestions. Step one is to buy drop cloth material at a home improvement store (mine came from Lowe’s). Tip: make your curtains the height of your walls (mine are 9′ tall, so I was able to buy 9′ drop cloths which saved me some hemming!). Then hang your bar 4-8″ below the ceiling and it gives you some pooling on the floor. Note: Smocking the material cuts its width in half. So before you begin cutting your individual panels, make sure you take that into account. If you want your panel to end up 3′ wide, you’ll need 6′ of material. Capiche? 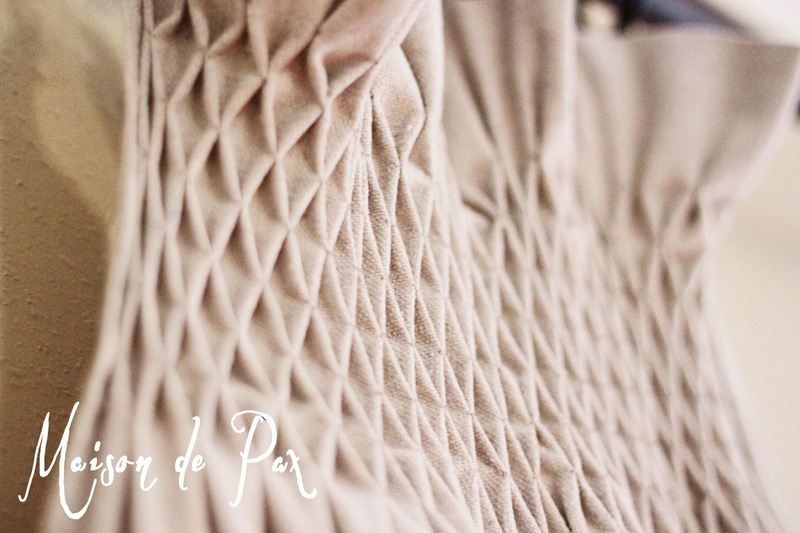 Finally, read this fabulous tutorial on honeycomb smocking. It seems daunting, but once you get rolling, it’s fairly mindless. I had never smocked before, and I managed without any major hiccups! 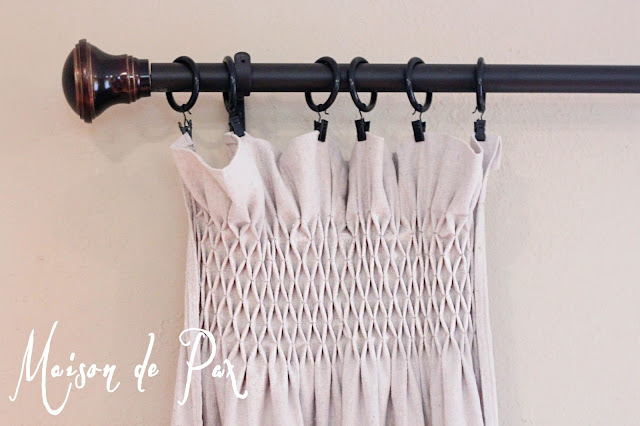 Start your smocking a few inches from the top (to provide a ruffle for the curtain clips). I chose to make my grid on 3/4″ (this will make sense once you’ve read the smocking tutorial). And voila! 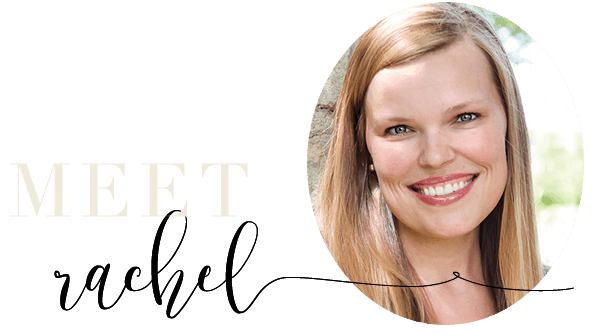 I love them in our living room because the drop cloth material provides a casual, comfortable backdrop, but the smocking dresses them up a bit and adds that hint of texture. Just so you know, I’m purposefully not photographing the full room for you because I’m creating suspense for my upcoming reveal in the interest of full disclosure, my son happened to be watching Curious George when I took the pictures. 🙂 But for a full tour of the living room, you’ll have to come back soon. I shared the entryway last week, and this room is next on the home tour. I love questions and comments, so please feel free! Thank you SO much, Shara!! Oh my gosh!! These are absolutely fabulous!! I am over the top in love! You are so sweet, Cathi! Thank you!! hello. 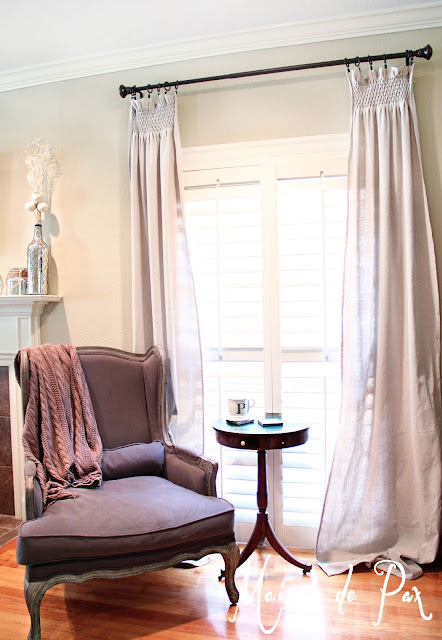 love your gray arm chairs in your living room. do you have a source? Thank you, Candice! They are called the Lorraine chairs from Restoration Hardware (you can find them here). We bought them a few years ago, but I’m pretty sure they were army duck fabric in fog. Hope this helps! You have inspired me! I love the smocked curtains seen online, however the price tag was a little scarey. After seeing your website and checking out the tutorial I am on my way to smocked curtains in my dining room. Thank you so much, Kristine! Yes, I actually cut my panels in half, so I smocked 3′ and ended up with each panel 1.5′ wide. I hope this helps! Hi! 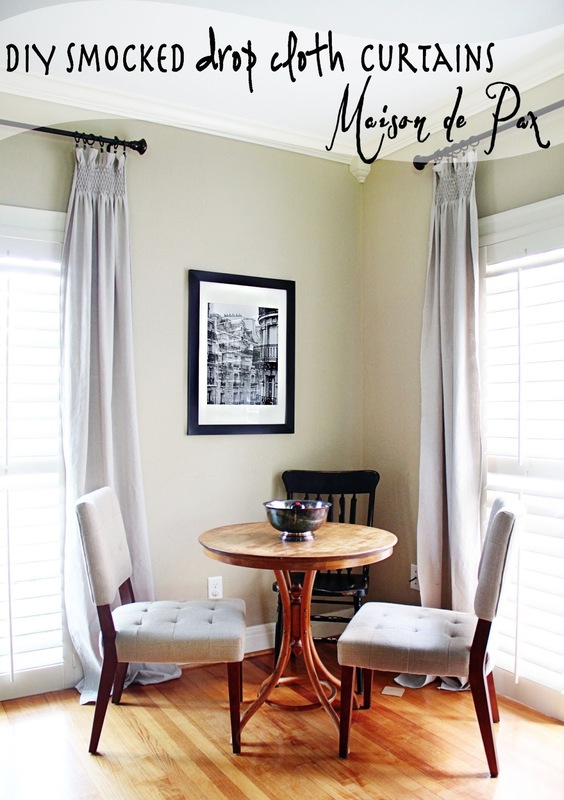 I LOVE how your curtains look and am now on my way to the store to make this project! I did have a question for you. Did you do just as the tutorial showed with the .4 inch dots to create the smocking? Or did you do this larger/smaller? I’m so glad you like them! I actually did mine with 3/4″ (.75) for my grid. I hope that helps! Smocking reminds me of the dresses my Mom made me so the beautiful curtains are extra special. I really love your smocked drop cloth curtains. Did you wash the drop cloths before you made the curtains? How will you clean them? Thanks! Washing and drying would be important as they might shrink! I’d recommend it. So beautiful! Thanks for sharing! This will be a great project to work on while LO is napping, so excited!!! I love using drop cloth, I have a big ‘ol sheet of pre-washed waiting for a project. I see the original post was a while ago but what would you estimate the total sewing time with no interruptions? (Like that’s really going to happen!) Thanks for all of your great inspiration! That’s a great question, Jill, but I’m afraid I have no idea! It was five years ago and I tackled it in stages… I actually hemmed and hung the curtains and simply took down one at a time when I had a moment to work on the smocking. I would guess without interruptions you could get one done in a couple of hours, but that’s a wild guess. I hope this helps! Thank you Katie! So glad you love them!